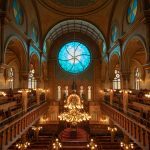 The Eldridge Street Synagogue may have been the grandest synagogue south of Houston Street, but it was by no means the only one. 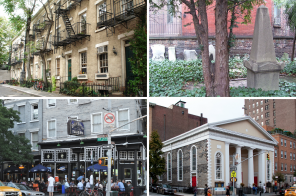 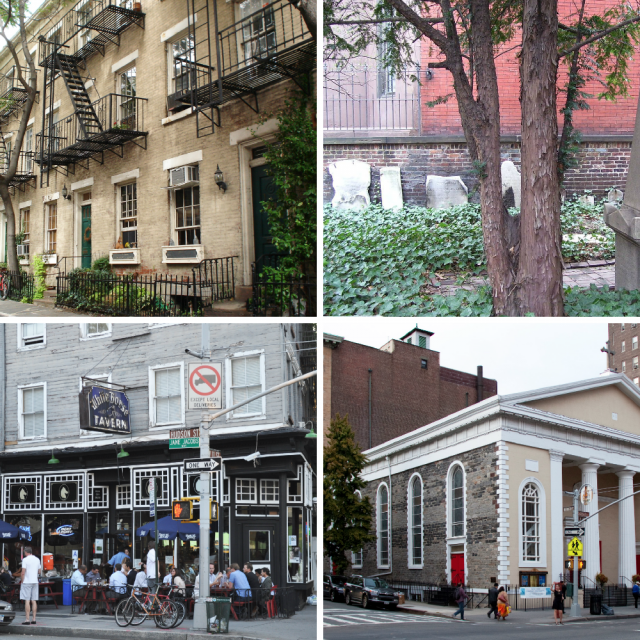 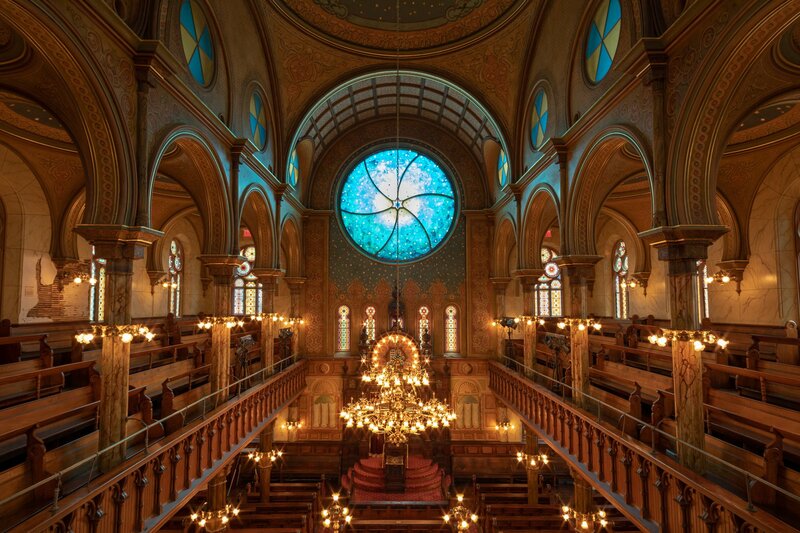 By 1910, the Lower East Side was home to over half a million Jews and more than 60 synagogues. 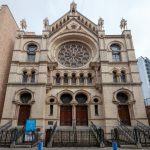 Several of the more prominent congregations vied to personify “the Jewish Community of New York,” and in striving for that title, the Eldridge Street Synagogue had a chief rival: Beth Hamedrash Hagodol at 60 Norfolk Street. 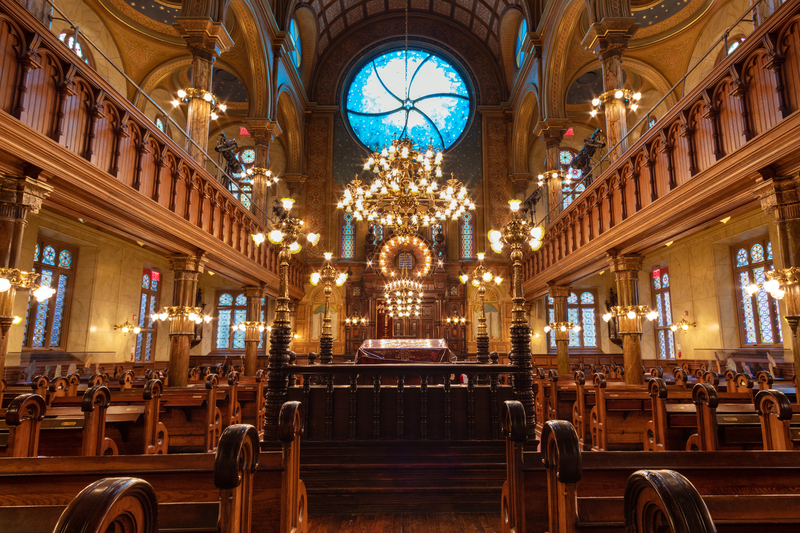 The Eldridge Street Synagogue had four original founders: Banker Sender Jarmulowsky; real estate developer David Cohen; plate glass dealer Nathan Hutkoff; and “The Kosher Sausage King of America,” deli man extraordinaire Isaac Gellis. 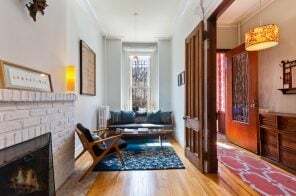 He founded Isaac Gellis Wurst Works in 1872 at 37 Essex Street and furnished the Lower East Side with a sausage factory, processing plant, deli, and butcher shop. 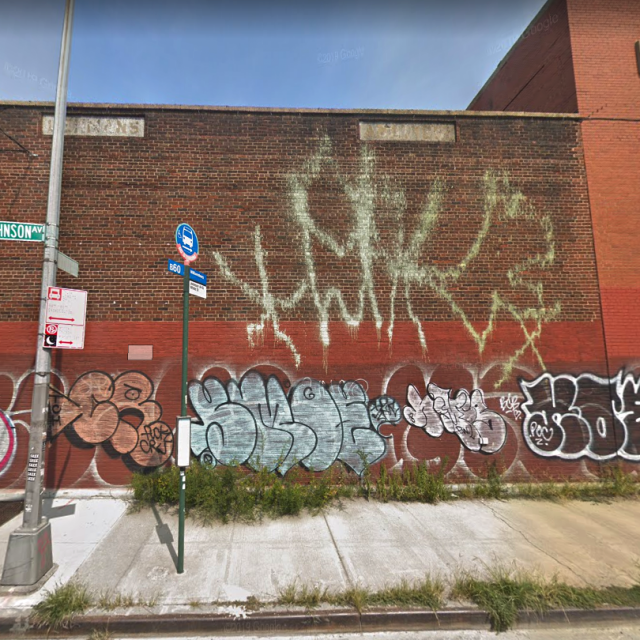 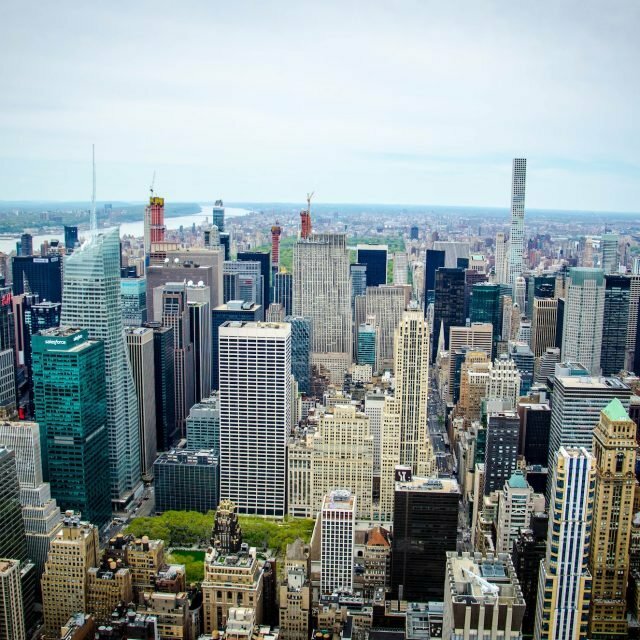 Because he got an early start in the business, before waves of Jewish immigrants began arriving in New York between 1880 and 1924, his sausage factory became an institution in the neighborhood. 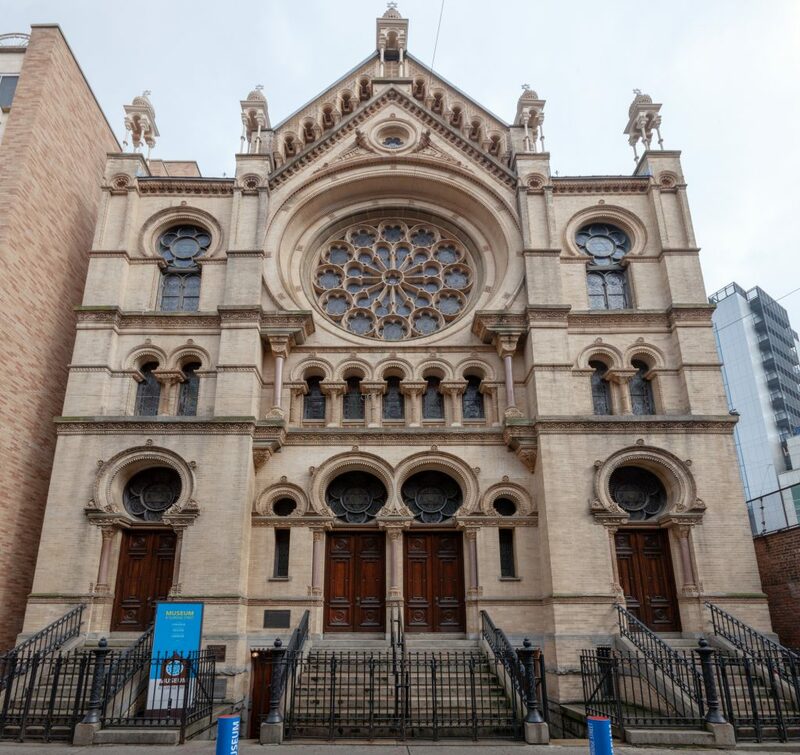 Gellis was president of the Eldridge Street Synagogue from 1895-1897, and his success in the sausage business allowed him to support other Jewish philanthropic organizations, such as Mount Saini and Beth Israel hospitals. 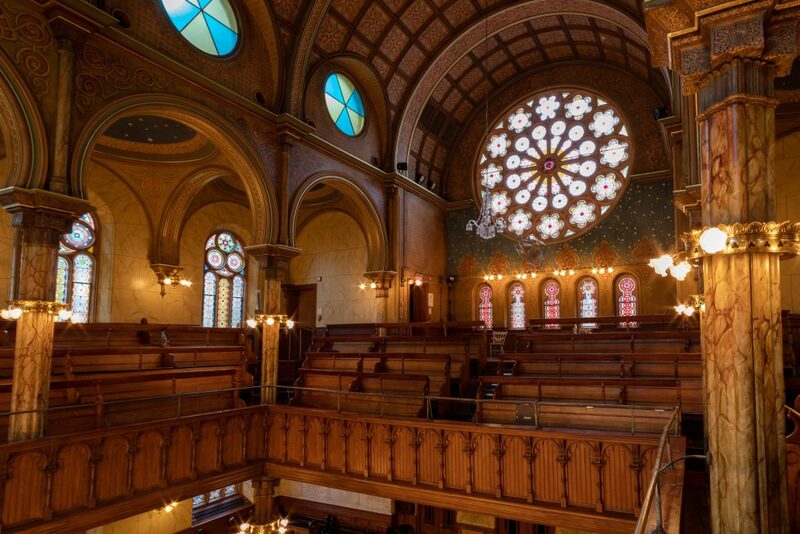 The congregation raised the funds to build the Eldridge Street Synagogue by selling numbered seats in the sanctuary. 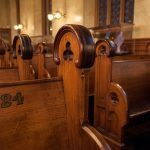 Buying a seat was serious business, complete with a formal contract. 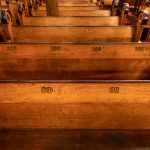 Those contracts reveal that the best seats (those closest to the ark) sold for hundreds of dollars, and seat #1 went for over $1,000. 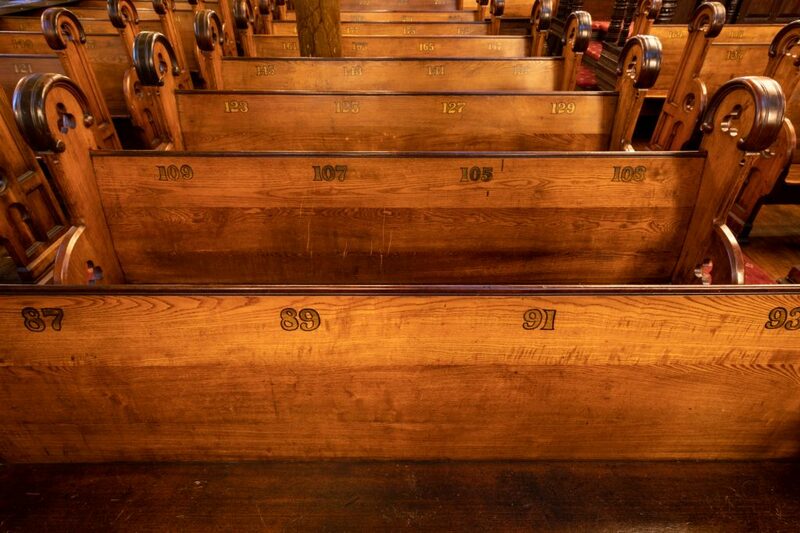 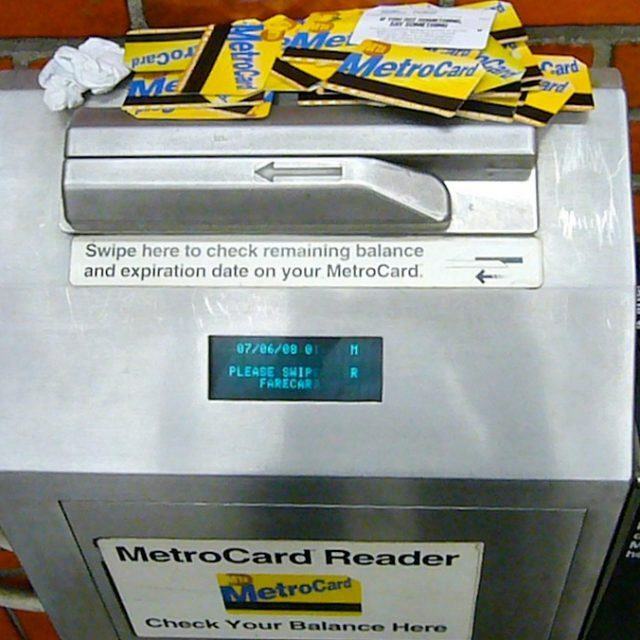 In fact, Isidor Abraham snagged seat number 1 in 1887 for $1,100! 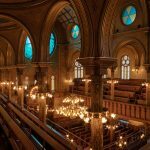 The Eldridge Street Synagogue was an Orthodox synagogue, dedicated to serving devout worshipers, but it was also a uniquely American institution. 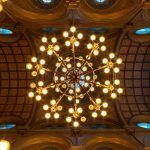 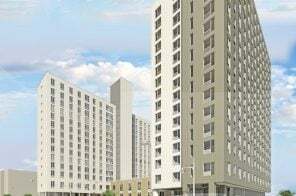 Immigrants from a variety of national and socio-economic backgrounds came together in a common community. 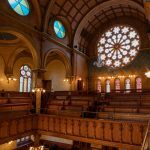 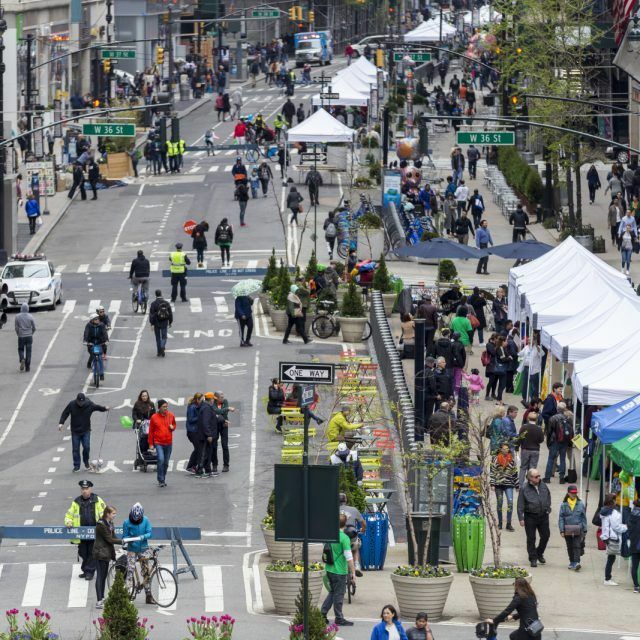 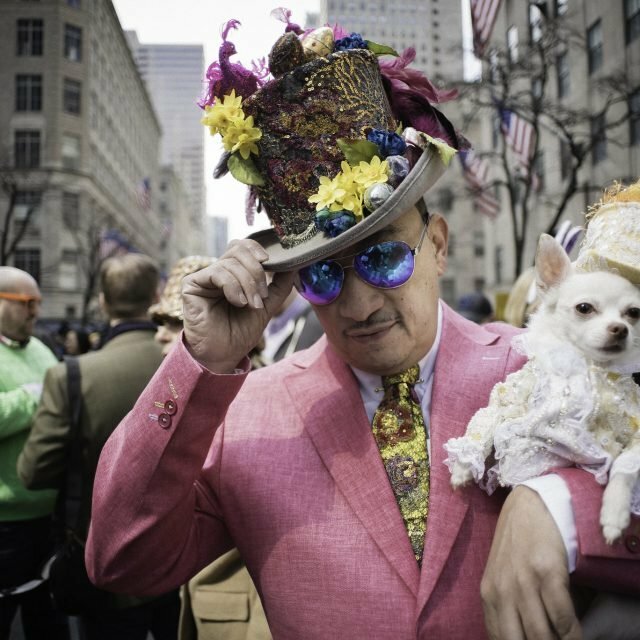 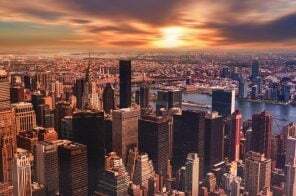 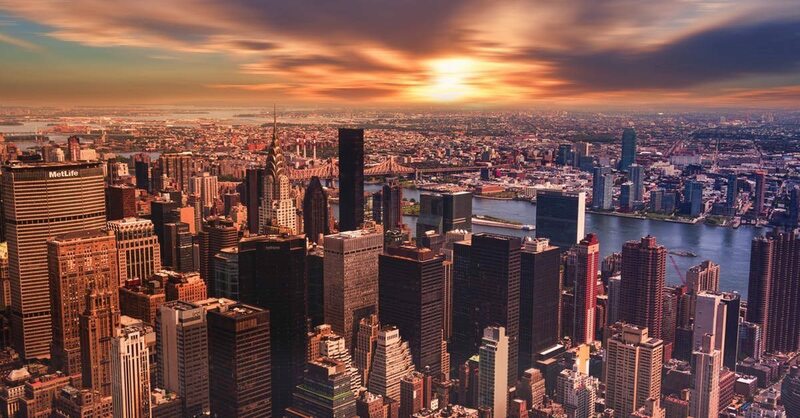 A journalist writing in 1892 described how the congregation reflected America as a whole, invoking the motto of the United States: “Lawyers, merchants, artisans, clerks, peddlers, and laborers, compose the dense but changeful throng. 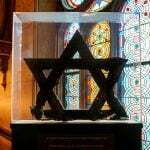 All are one in respect to race and faith, but many in regard to birthplace and speech. 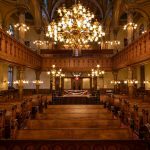 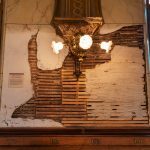 E Pluribus Unum finds new meaning here.” Fittingly, the congregation celebrated landmarks in its adopted home, decking out the synagogue in honor of the centennial of Washington’s inauguration in 1889. 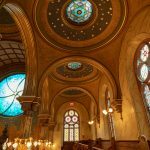 The Eldridge Street Synagogue is spectacular and ornate, but the interior appears much more opulent than it really is, thanks to dexterously applied paint, designed to trick the eye. 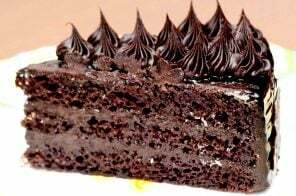 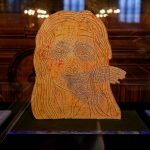 What appears to be fine marble and mahogany is really fine brush-strokes. 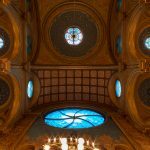 Faux finery helped the congregation economize while still creating a sumptuous, aspirational space. 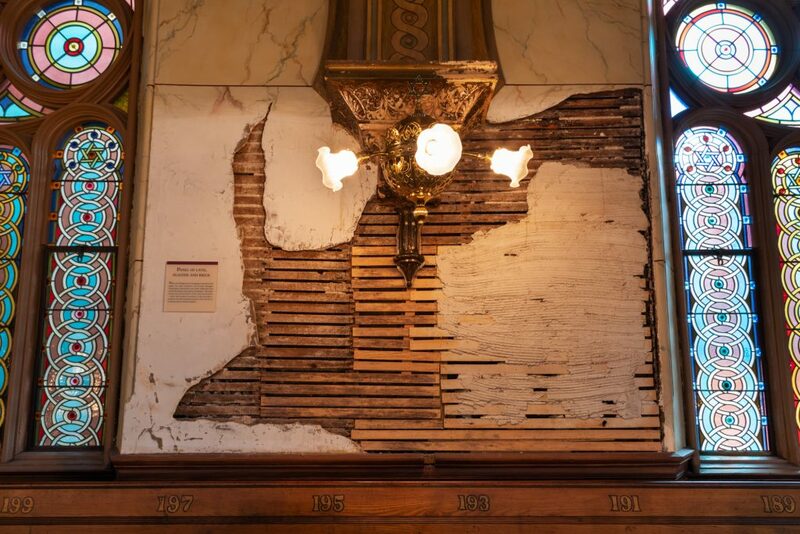 Faux marble was far less expensive than the real thing, but the Tromp L’Oeils painting is just as beautiful. 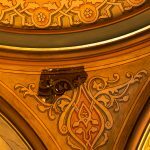 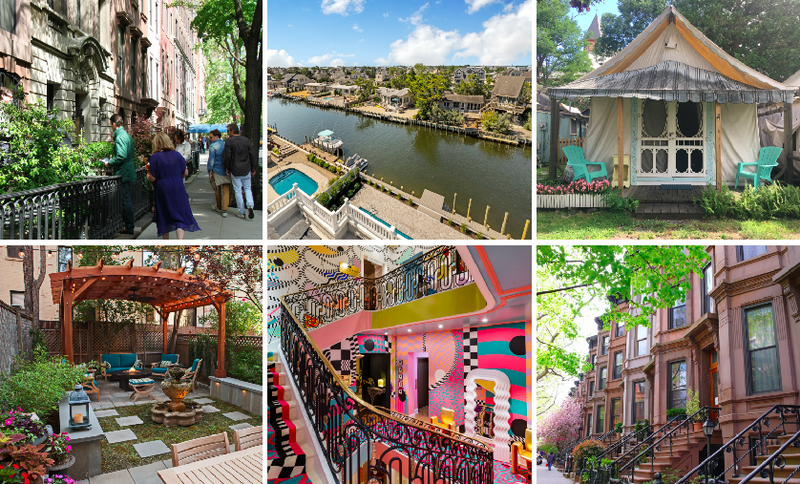 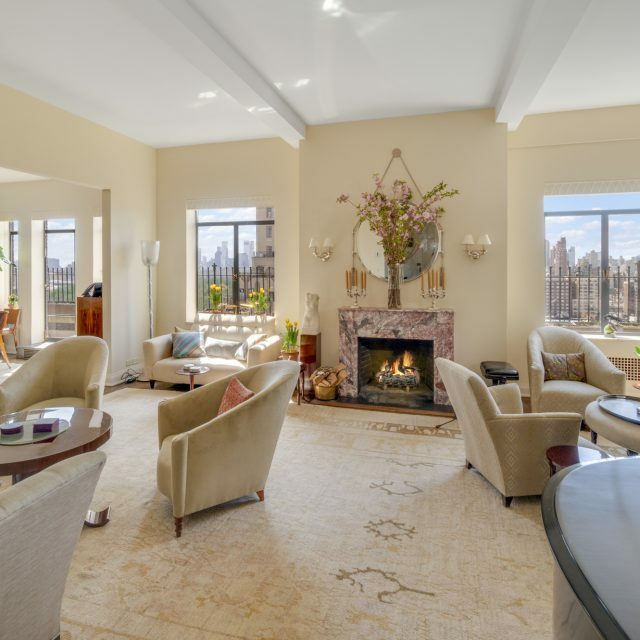 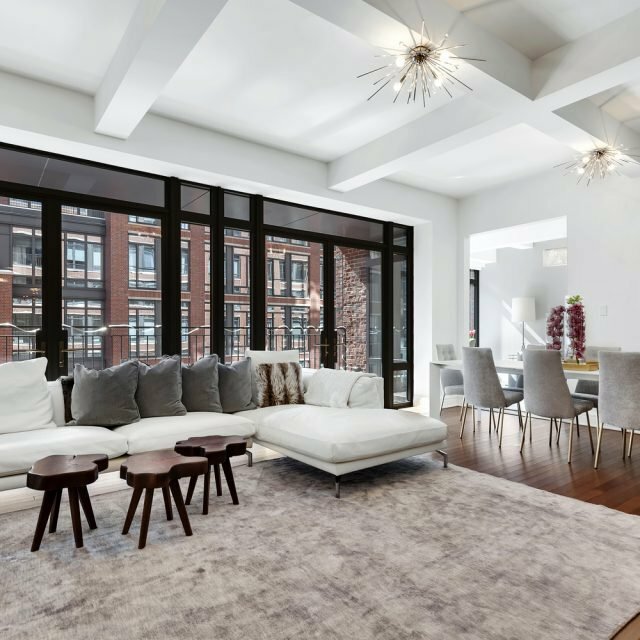 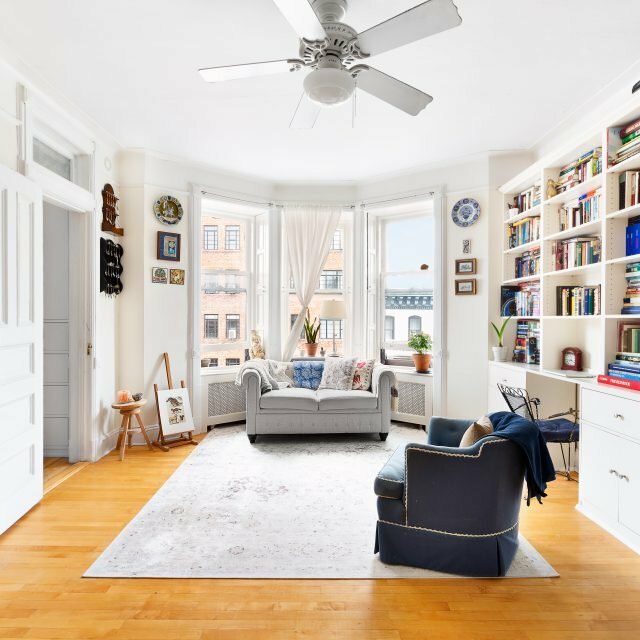 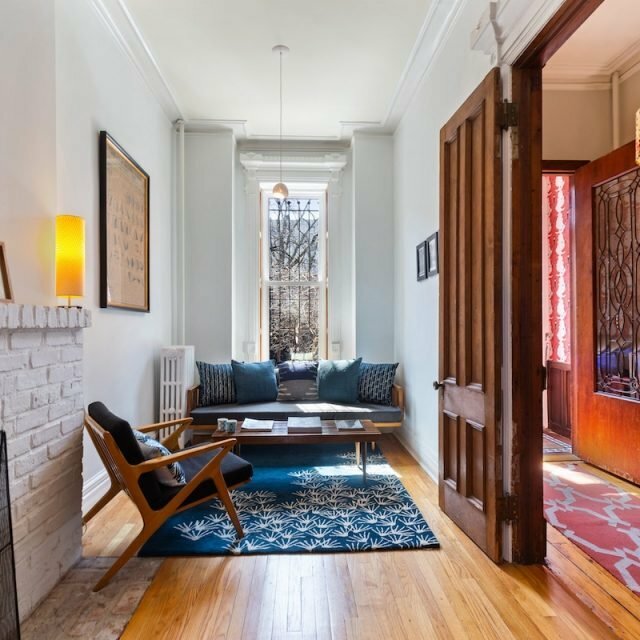 Because these touches were all originally painted by hand, there are some fun idiosyncrasies in the paint, like a small heart hidden in one of the arched domes above the balconies. 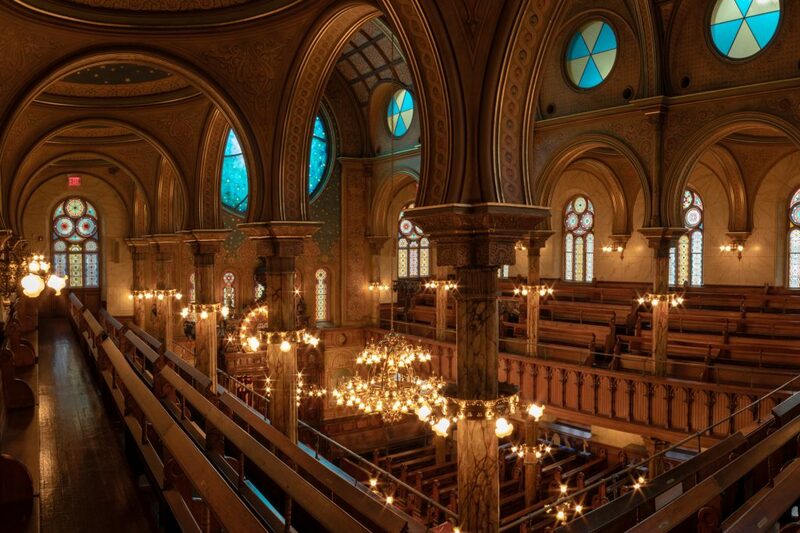 All that painting is stunning, but not every part of the synagogue was restored. 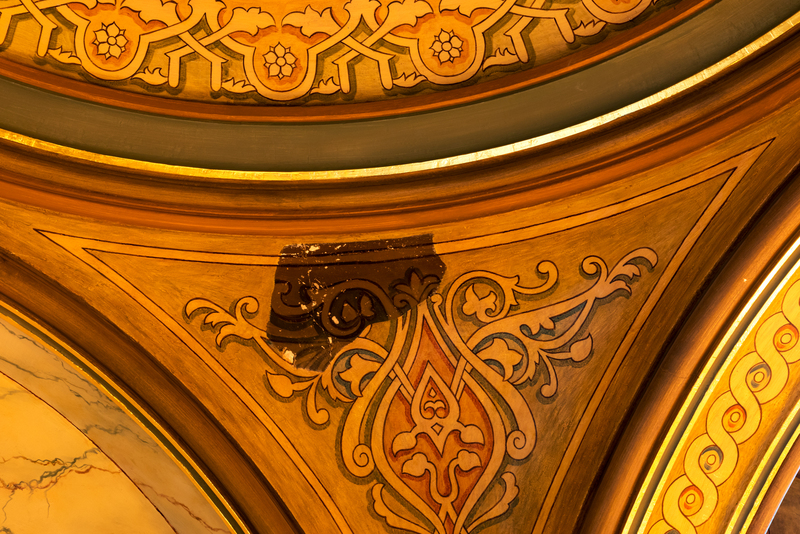 Two sections of the sanctuary’s walls remain in pre-restoration condition to show the state of the space before the restoration began, along with a piece of the decorative paint. 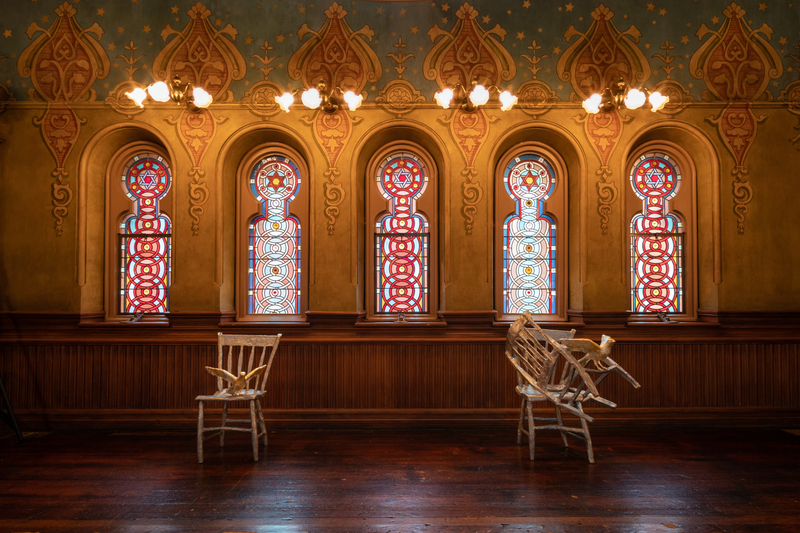 Similarly, the original toilets in the basement of the synagogue are still around, complete with rusted old pipes. 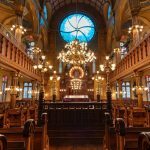 Jewish Congregations in Europe began using the Moorish style for their Synagogues as early as 1830 because congregants wished to move away from Christian inspired architecture such as Gothic Arches and to embrace a more distinctly Middle Eastern heritage. 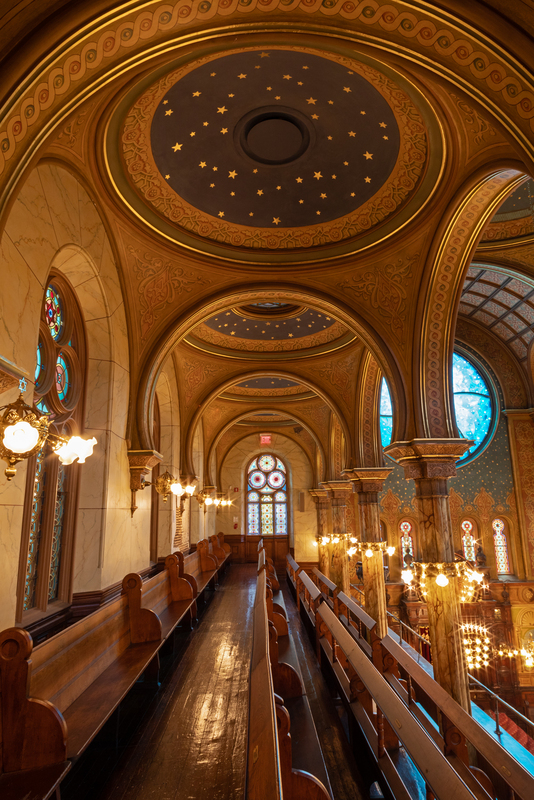 The style remained popular for Jewish sacred spaces in Europe and the United States up until the First World War. 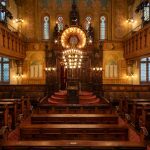 The Ark is a special cabinet in a synagogue where the Torah scrolls are kept. 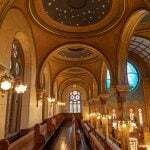 The Eldridge Street Synagogue has two of them. 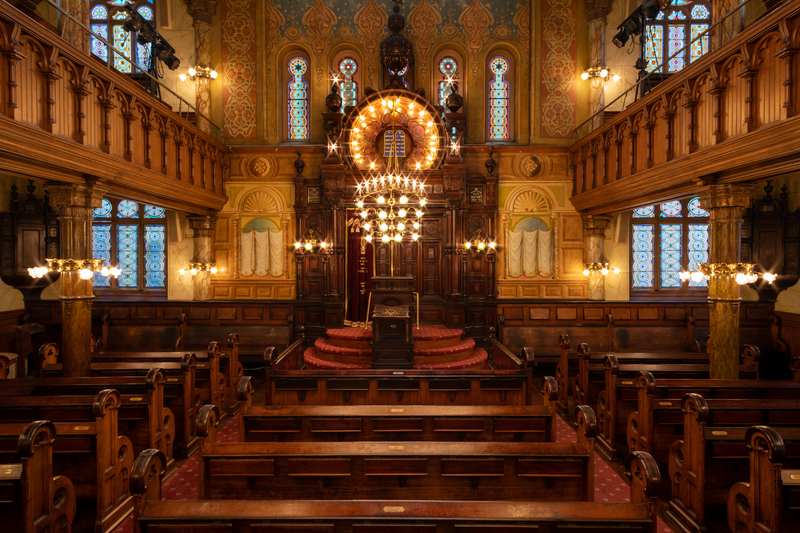 The smaller one, kept downstairs in the study hall, predates the synagogue itself and was borrowed from a make-shift prayer space at 78 Allen Street, where the congregation worshiped before it moved to Eldridge Street. 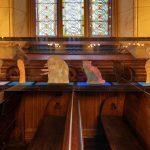 The Ark in the main sanctuary is made of hand-carved walnut, and it still sports its original red-velvet lining. 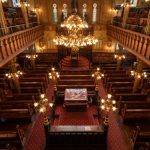 It is a particularly impressive ark because it has space for 24 Torah scrolls, a mark of the synagogue’s history of community service. 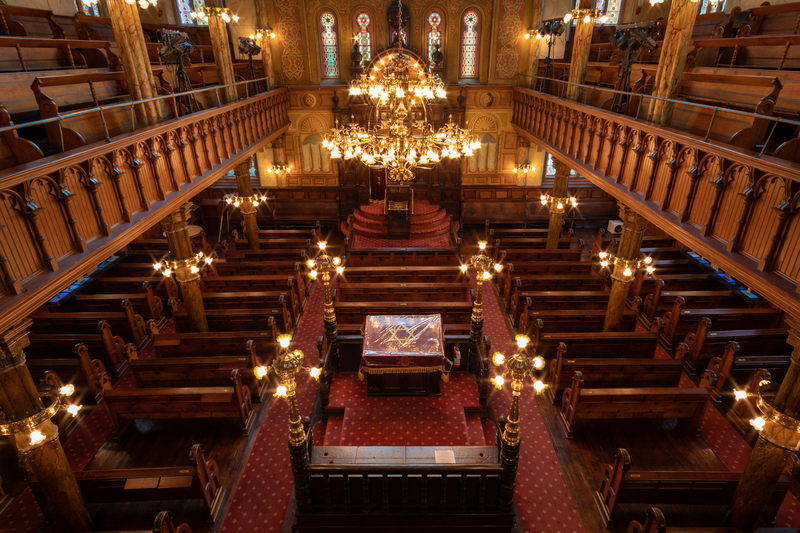 The synagogue was built amidst a host of smaller congregations in the area, which each had its own Torah. 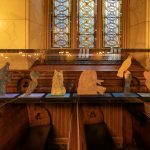 When those congregations began worshiping at Eldridge Street, their scrolls found a home in Eldridge Street’s Ark. 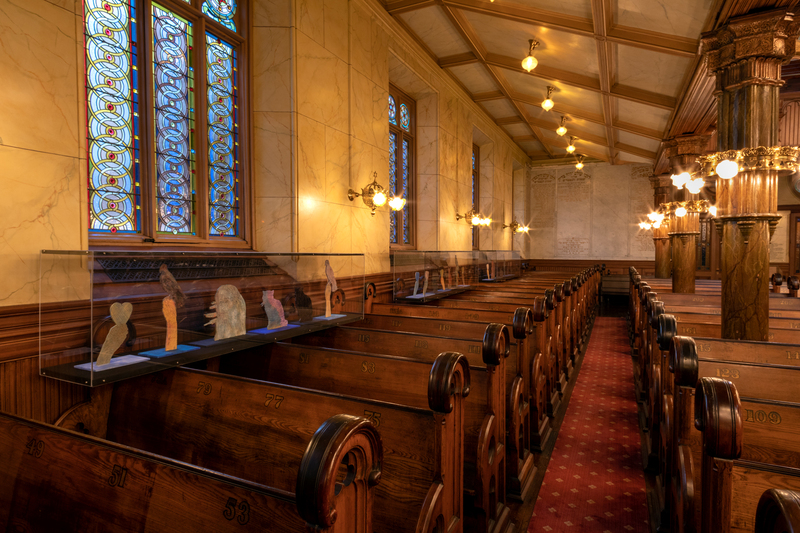 Worshipers were wowed during services when the Ark opened to reveal so many Torahs! 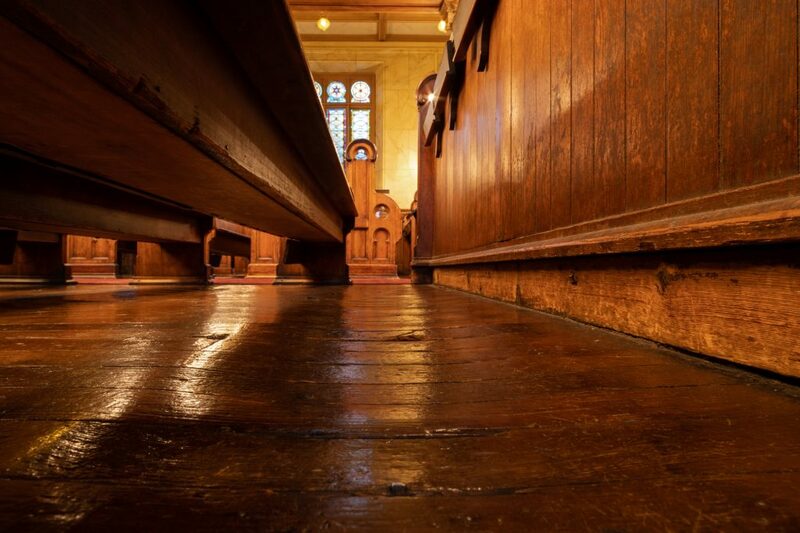 Speaking of worshiping, very little was done to restore the pine floors of the main sanctuary. 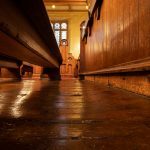 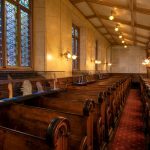 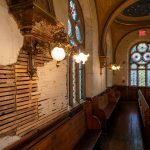 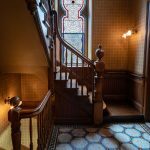 Rather than sand down the floors to opening-day condition, they were preserved as-is to bear the grooves, bends, and warps from decades of davening (or praying). 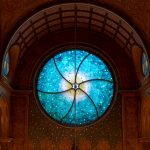 Smith and Gans won a competition to design the window. 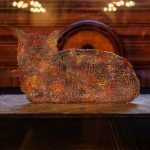 Their extraordinary piece, installed above the Ark in 2010, is made of 1,200 individual pieces of colored glass etched with over 650 stars. 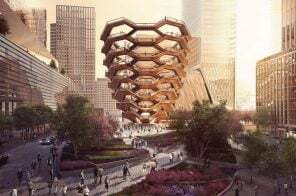 It spans 16 feet, weighs 4,000 pounds, and sits 50 feet above the ground. 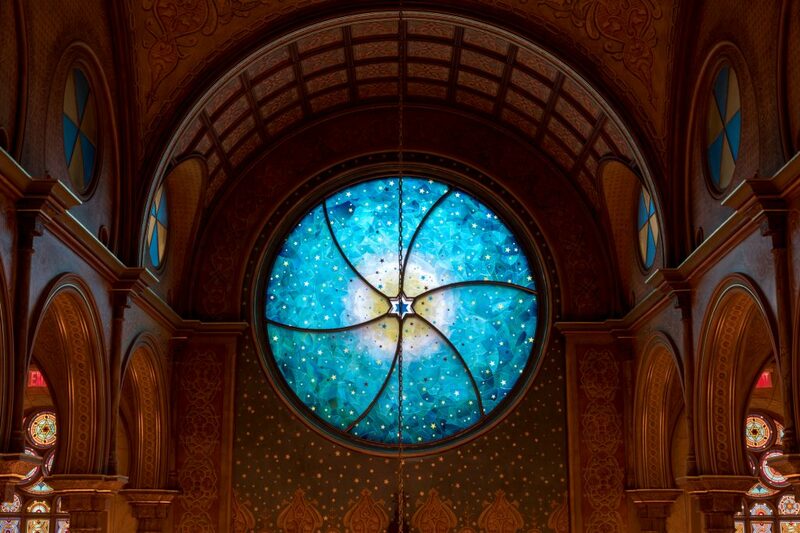 The window is strikingly luminous, letting in much more light than ordinary stained glass windows; it shines so brightly because the individual pieces of glass are fused together with silicon instead of lead, a technique that was pioneer in Germany and used for the first time in the United States on this window. 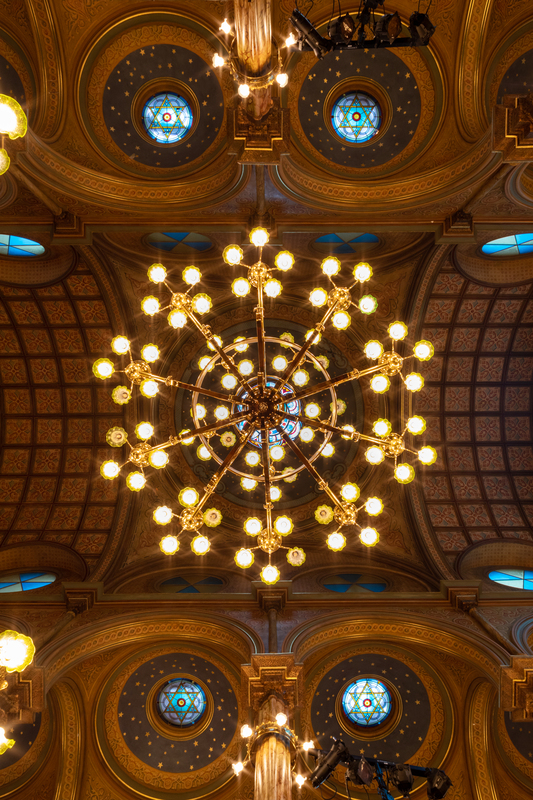 It features not only a six-pointed Star of David, but also many five-pointed stars because they appear on the American flag and the Eldridge Street Synagogue stands as an American monument as well as a sacred Jewish space. 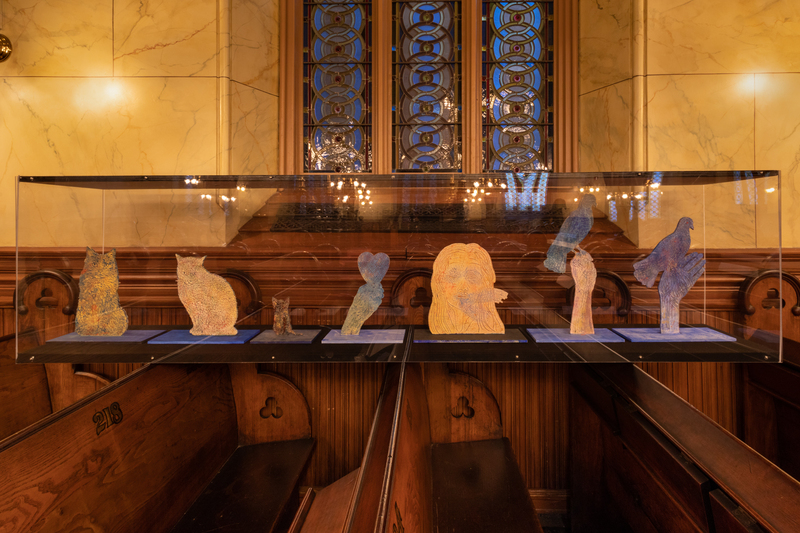 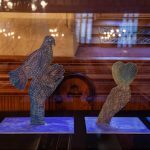 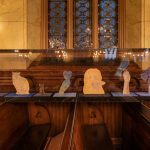 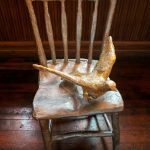 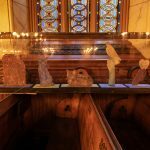 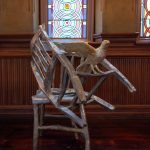 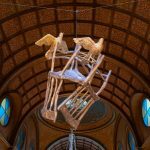 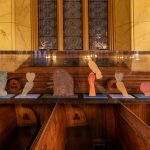 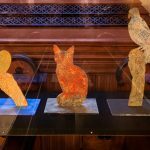 Kiki Smith returned to Eldridge Street with a site-specific installation titled “Below the Horizon.” Along the sides of the main sanctuary are dozens of flat wooden sculptures with incised cross-hatching that were painted to contrast the stained glass above. 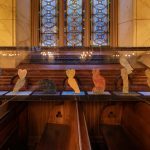 They include hands holding hearts (a symbol of charity), cats, birds, and a face that resembles a self-portrait. 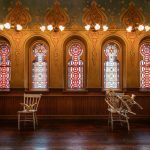 The other portion of the installation is on the top floor, which was originally reserved for female congregants, as the Orthodox tradition is to have them sit separately from the men. 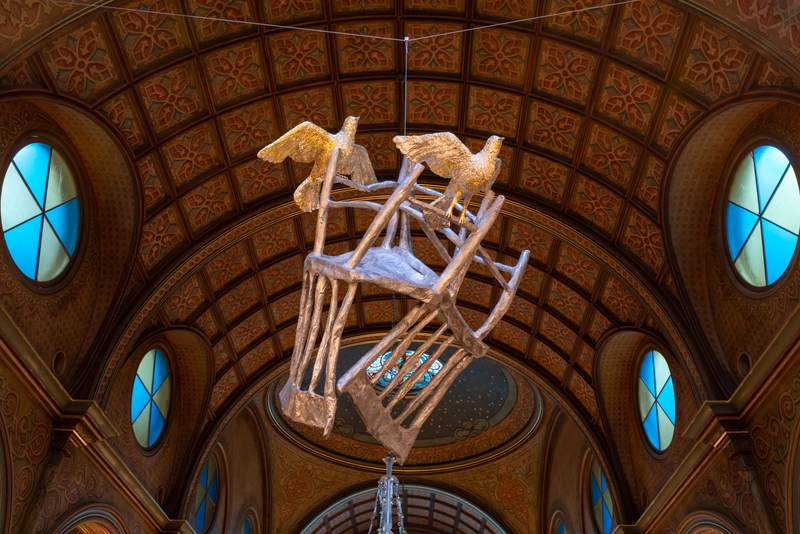 These silver sculptures are of pigeons on chairs, an interpretation of the synagogue in its once-abandoned state when birds flew through holes in the roof.